ratio arms are 100 ohms each. Low-impedance elements are a requirement of high-frequency measuring circuits. These arms are wound on thin mica cards. Both transformer and ratio arms are mounted on plug-in bases so that they may be transposed or new ones inserted. The balance condenser has a capacitance of 1000 ppi and is provided with a slow-motion friction drive. A small .vernier condenser of 15 p. pi allows the adjustment of the total capacitance to 0.01 fx pi. The variable resistance for power-factor balance has three dials, tens and units decades, and a non-inductive slide wire having a total resistance of one ohm and reading to 0.01 ohm. 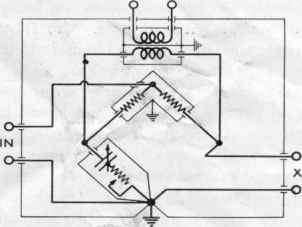 The zero inductance of this 3-dial resistance unit is only 0.2 microhenrys and the maximum inductance 1.1 microhenry. The leads from the condenser and resistor are brought to a terminal board located in a shielded compartment accessible from the front panel so that they may be connected in series or parallel or used separately. The measurements are most easily made with a modulated carrier as a power supply and a detector and audio amplifier as a null indicator. An alternative method is to use an unmodulated oscillator, heterodyne to it, and use the rectified audio beat note as a null indication. It is essential that there be no pickup between oscillator and amplifier. Both must, therefore, be well shielded. The shielding of the oscillator must be comparable to that of a good standard-signal generator. Either the Type 403-D or Type 603-A Standard-Signal Generator is suitable. and to the speed with which the balance can be obtained. An oscillator having an output of about 25 milliwatts modulated to 50% is being developed. This instrument will maintain about one volt across the bridge at frequencies between 20 kc. ami 20 Mc. It is completely shielded and uses toroidal coils, so that its external field is very small. The most available null detector in the broadcast range is a standard receiver of good sensitivity. Commercial superheterodyne receivers having a 10-microvolt sensitivity are entirely satisfactory. Using such a receiver at full sensitivity and merely listening to the loud-speaker, the bridge can be balanced to one part in 100,000 for capacitances of the order of 1000 pp.f and to one part in 10,000 for resistances of the order of 100 ohms. These measurements were made in an unshielded room and there was noticeable outside pickup in the receiver. Type 222 Precision Condenser and either the decade resistor in the bridge or a similar external one. The impedances measured have included the capacitance and resistance of air and mica condensers, varying from 100 mxt to 1000 /x/d, the resistance and inductance of resistors varying from 1 to 10,000 ohms, and the resistance and reactance of an antenna whose natural frequency was 1.2 Mc. over the broadcast frequency range. The antenna measurements were interesting in showing that the voltages induced in fairly large antennae may approach a volt in magnitude. It is, therefore, desirable that the voltage applied to the bridge be at least of this magnitude and preferably larger, so that measurements may be made at all points. The Type 516-A Radio-Frequency Bridge has been developed to permit the investigation of the possibilities of bridge circuits at radio frequencies. It will not be regularly carried in our catalog because we feel that an experience in high-frequency measurements which is not possessed by the average experimenter is required in order to obtain satisfactory results with it. It will be available in stock, however, and offers an interesting and useful tool for those possessing wide experience in the technique of high-frequency measurements. The price of the Type 516-A Radio-Frequency Bridge is $190.00.